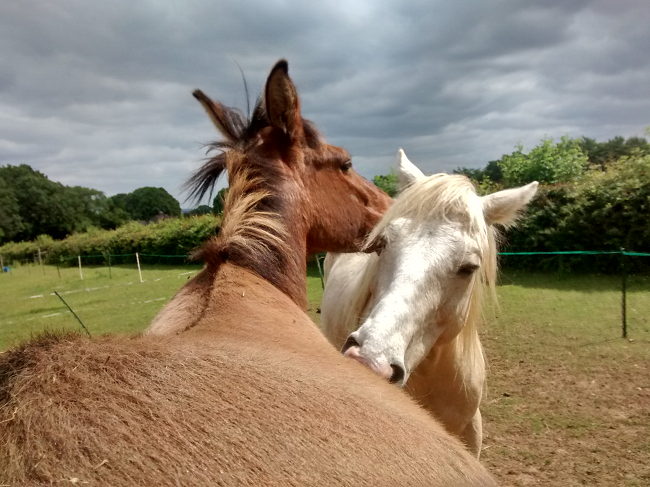 As far as I can tell, the mule spends his time gently oscillating along the spectrum between feral and tame. He can be domesticated for weeks, sometimes months at a time, and I start to feel like we’re making progress; and then the call of the wild claims him, and he’s back to pretending that he’s never worn a halter before or been handled by a human being or ever done anything other than live in a field and feel the wind blow in his mane. It can be quite frustrating. His summer coat is starting to come through. He looks very noble. Last week, our old friend the I-Won’t-Be-Caught monster returned. Ben and I were bringing Iris and Marty in, and just as I was putting Marty’s halter on he panicked and ran out backwards. 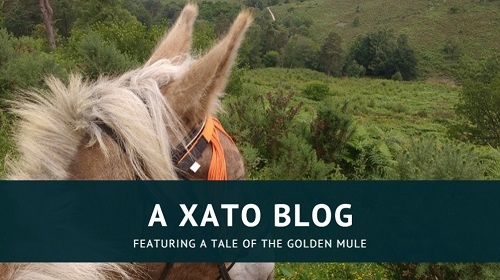 There had been horse riders passing on the road behind us, and I thought the reason for his sudden fright might be that he’d been paying attention to them rather than to what I was doing. Either way, I wasn’t overly concerned. I’d initially tried to hold him, then dropped the halter as he broke free – but he didn’t go far, only retreating a few steps. When I picked it up he moved away, so I followed him; keeping pace until he turned to face me, then using approach and retreat until I was able to stand at his shoulder and try haltering again. He ran away and I handed responsibility over to Ben, who has an infinite resource of patience for this kind of thing. Ben was eventually able to catch him, but Marty was now of the firm belief that the halter meant certain death and could not tolerate it being moved at all. This is an old and insidious fear of his; I’ve known for a long time that he appears to have an unusually high sensitivity to anything that moves and/or makes a noise while touching him. 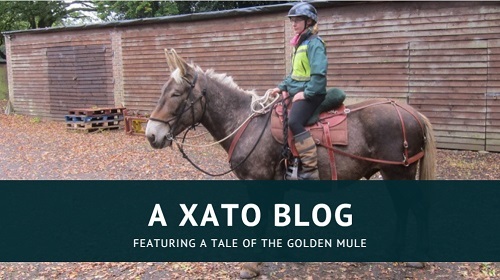 Despite all the flagging and the ropework and the desensitising with saddle pads and blankets, his anxiety only ever seems to lie dormant. I have a strong suspicion that, although we’ve always been so careful to avoid it, his apparent acceptance of things is simply him shutting down and ignoring the problem. Ben disagrees, as he points out that Marty is still responding to and interacting with the flag or the rope or whatever object I’m using, and would not be doing so if he had shut down. The other option is that I’ve caused this myself by being too soft and slow and gentle with him: he does have sensory issues, but has only learnt to tolerate careful, controlled movements and anything done business-like is too much for him. Marty was very grumpy about the horses having to wear their rainsheets one night. At first he thought he might have to wear one, and then he realised that they were effectively armour and he wouldn’t be able to bite Cash. Watching him run backwards at full tilt that evening, rearing when he felt pressure behind his ears and then start thrashing and corkscrewing from side to side, it would have been easy to assume that he was a totally wild colt who we’d just roped and brought in off the plains. This is the mule whose direction and speed I can normally control by my body language, or by sending the slightest of feels down the rope. 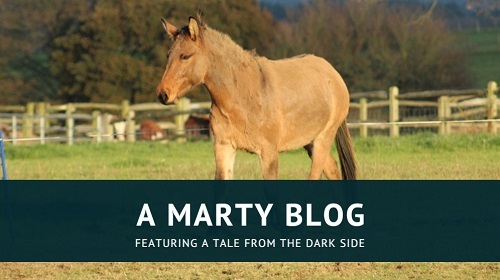 I was a little taken aback by how violently Marty fought the halter. 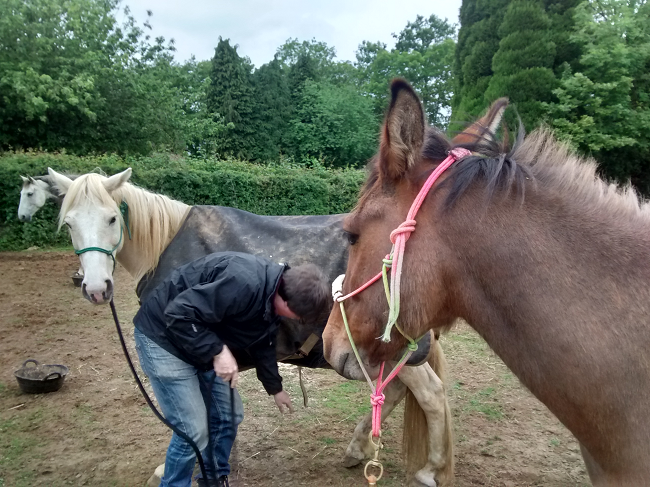 Ben kept the energy as quiet as possible and worked on asking him to lower his head by laying a hand on his crest, and tried to help him realise that the halter moving around was not actually hurting him. Marty often makes choices that result in frightening him – such as the problems we had with feet handling, when he would slam his foot down and knuckle over, then blame the fact his foot had been picked up rather than the fact that he’d snatched and stamped it. The problem with this is that it is then very hard to dissuade him from his belief, because he will keep imagining that the scary is going to happen and so he’ll react badly and then of course the scary does happen and it ends up being a vicious circle. I think this is what is happening with the halter. 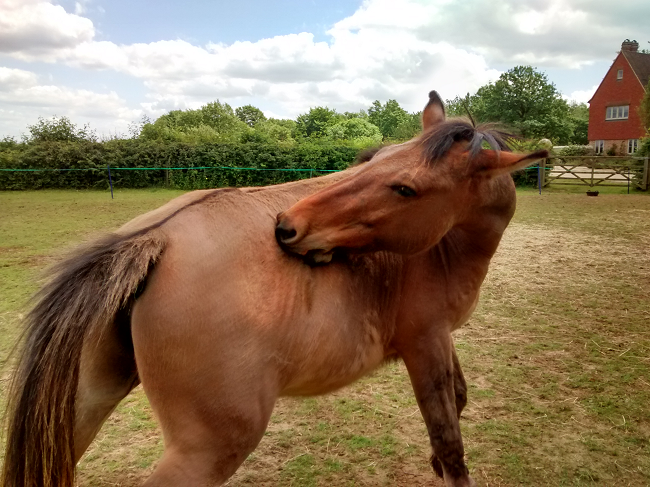 He is a very stretchy mule (and yes, I did scratch the spot he was showing me!). Later in the week we spent some time in the arena with him, using the stick – with its soft leather tag on the end – to touch his neck and poll. Using my hand to do this was no use, because if Marty ran backwards I couldn’t stay with him and all that taught him was that running out was the answer. The stick was a useful arm extension. He was pretty good about this, particularly as there was a wedding party being held further up the lane with a live band and very loud speaker system. He didn’t react at all to all the noise, so that’s something I guess! 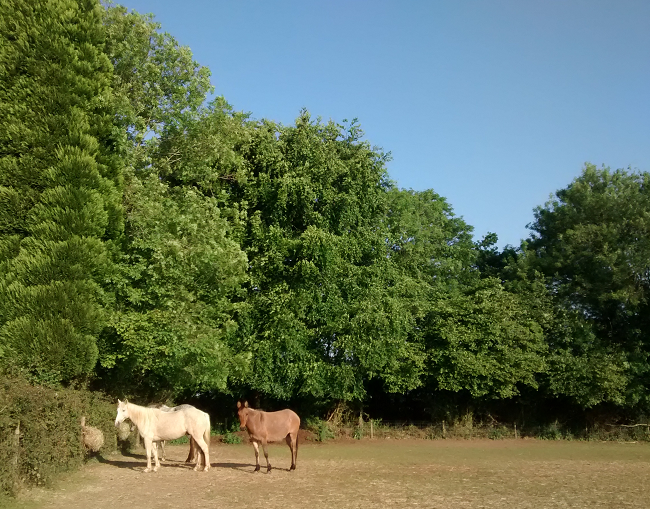 Then on Monday, Ben and I arrived to find that the herd had broken through the electric fence and had spent most of the afternoon pigging out on the fresh grass. I sent the horses back into the main field, then put the fence back up with Marty still inside. It was a smaller area and I figured I may as well use it to my advantage. Ben took Iris away and I set to work with Marty. Marty was buzzing with anxiety and sugar. He ran around for a bit until I was able to draw him in to me. He let me stand at his shoulder and stroke his neck immediately, and didn’t flinch when I moved my hand over and under his neck or showed him the halter. He even allowed me to stroke him with the halter. However, despite this lack of opposition, I could clearly see that he was extremely tense, his eyes had a glazed look to them, and his mouth was very tight. Although I could have tried haltering him very early on in the session, I chose not to as I wanted to show him that I was open to a conversation and that I wasn’t going to be putting anything on his head until he was more relaxed. We spent a while just hanging out, working on touch and head lowering, and I made sure to step back and give him thinking space whenever he offered me the smallest try. Eventually, I progressed to reaching up and putting the crownpiece of the halter round his neck as though I was about to halter him. He turned his head away, and I knew that going further would result in him running and ruining what I’d just spent the past twenty minutes or so building up. However, I wanted him to turn his nose back towards me first so that I rewarded the try, not the evasion. I had the halter in my left hand and my right hand over his neck, holding the crownpiece. My timing had to be good – I needed to release the rope as soon as he turned in to me – and because I didn’t want to risk frightening him by dropping it I had to move my left hand under his neck so that I could hold the other end of the crownpiece. Even though this caused the halter to brush against his shoulder, he was absolutely solid and I murmured praise. Then I almost blew it by putting pressure on the rope to help him decide to turn his nose in. It was just a gentle “come here” that I asked for, but it caused him to tense up, hold his breath and rock his weight to his outside feet. Luckily, he didn’t run, and I maintained my hold – but did not pull on him – until he brought his head round and I let him go. I praised him and moved away. His ears came forward and I could see his surprise as he considered what had happened. 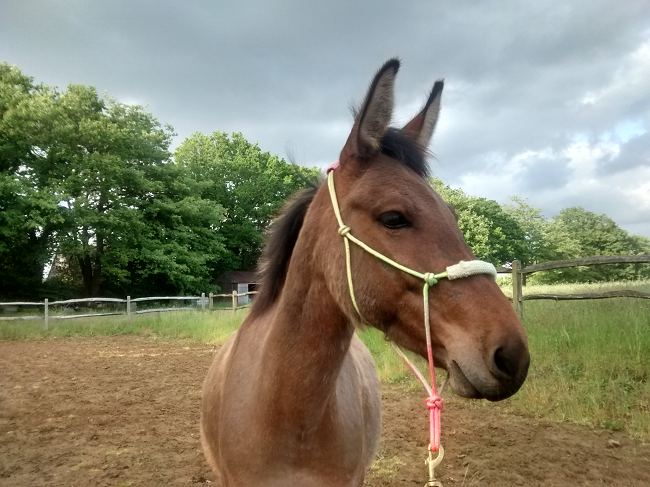 I felt like we’d hit a turning point and, sure enough, when I tried again I was able to slip the halter on – albeit loosely, with the crownpiece down his neck and away from that troublesome poll area. He got a treat, plenty of praise and a good whither scratch followed by an extended thinking time. My plan then was just to bring him out of the fenced area and let him go, but as the halter was very loose I wanted to tighten it a little first – if he objected to coming with me then I didn’t want it to fall off the end of his nose. Now I’d moved the crownpiece along his neck when I’d caught him, as it had been too far back for the knot to be tied, and he’d been fine with that; but when I tried to shift it further up he became extremely agitated. I stayed calm, moved him away from the fence so that he’d have no reason to feel trapped, and tried again from the other side. He responded by rushing backwards and ripping the rope through my hands. Luckily, he stopped before I ran out of rope entirely so I kept hold of him … and my smoking hands were merely a reminder that I should have been wearing gloves, like a smart person. This had caused the noseband to slip down and it now lay across his nostrils. To avoid damaging that nasal bone, I decided to move it first before I tried again with the crownpiece. As soon as I touched it he paniced and tried to pull away; I stayed with him, waited when he did, and then tried again. This time he shot backwards, went up and began thrashing from side to side like a salmon on a line. The halter came off and he set to running. I was able to direct him at first, but then he got past me and jumped straight over the fence and back into the main paddock. On the plus side, it was a very beautiful jump and I was able to admire it as it gracefully took my mule and my sense of humour along with it. 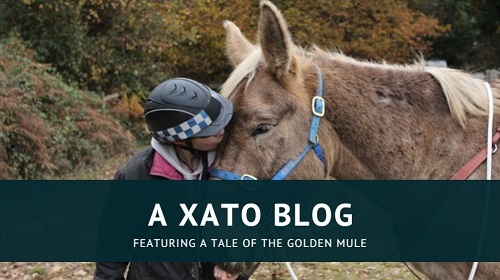 I left him to it that night, as it was very late by then and I knew I would have to start all over again from the beginning – but this time in a larger area, and with a very unhelpful Cash pony who also had a belly full of fresh grass. Marty was entirely sugar-addled thanks to their fence-demolishing escapade, and would have been difficult to work with even if we hadn’t been having a tough week to begin with. Ben has been working with him since then, just going over the basics of being able to halter him and unhalter him without drama. He’s also asked Marty to respond – sensibly! – when different parts of his halter have pressure applied. Marty ought to respond to having a finger hooked through his noseband by bringing his head round, not panicing and throwing himself backwards. This evening I was able to put the halter on more or less straight away, although Marty was still tense about it. Interestingly, he was fine with me moving the halter to adjust it, but as soon as I touched the knot to take it off again he became anxious and we had to have a discussion about not running backwards. Once I was able to touch the halter again, I took it off and he ran out as I did so; so I caught him again, asked him to follow a feel on the tail end of the crownpiece, then took it off – this time with no reaction from Marty. On the one hand it’s a shame that we have to keep going back over this basic stuff, but it does mean that I’m getting really good at it, even if the constant practice appears to have no effect on Marty!